“…some great puzzles, and a beautiful world with stunning visuals, makes this a game I will find hard not to recommend to any gamer”. “Aporia is an absolutely stunning adventure game that is reminiscent of Samorost, Botanicula, and Machinarium in terms of graphical beauty and, largely, dialogue-free storytelling. If you’re into classic point and click games you will love this modern evolution of the genre into 3D, and truly the graphics, music, and atmosphere of the game really do speak for themselves. ”. You awake abandoned after hundreds of years of sleep in an crumbling temple of a once a mighty civilization. Outside a ruined city lies deep in the grip of a jungle. Immersed in this world of dark beauty, thrilling mystery and ancient structures, you embark on a quest to discover the truth about who you are and what disaster befell this magnificent ancient world. Explore a verdant landscape, vast temples and master ancient technology to reveal the macabre secrets of this haunted, forgotten world. 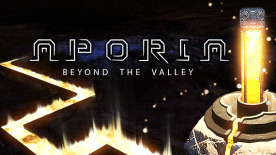 With revolutionary story and puzzle mechanics, Aporia: Beyond The Valley, reveals a dark and deadly past and sounds a warning to our possible future.